Happy Wednesday Everyone!!!! I am totally new at Blogging so I thought I would start spreading my blog by offering a BLOG CANDY!! I think right now I am following about 50 blogs and I know there are soooo many others out there that I have no idea exist. I was hoping that this would bring others to my blog and I would be able to find others too!! I love being inspired from others and would love to see all your work out there in cyber land!! I just created my Blog over the weekend and I have so many cool plans and ideas I want to share on my blog so following me hopefully, you will enjoy. There is some yummy stuff inside. Something for everyone now matter what your style is, I tried to put in a variety!! Here is how you qualify. Leave a comment to this post, mention it on your blog, and become a follower of my blog. My goal is to have 100 followers by May 14th. If I have over 150 I will throw in an addition stamp, either bella or house mouse, whoever wins, whichever they perfer!! I will ship anywhere just email me your address if you are the lucky winner!!!! Here are the contents of the BLOG CANDY!!! Hope it sounds Yummy!!! All my followers now are qualified just add my link to your blog and leave a comment!!! Hopefully by May 14th I have my goal so I can give these things away... Good Luck to all, and Happy Stamping!!! Hi Crystal, great candy!! Love your blog and style. Smart Girl! Free stuff right off the bat :) Maybe I should try that, too since I'm pretty certain most people don't know my little blog exists! LOL!!! Your cards are amazing! You're very talented! Oh My Crystal. Love your new blog. congrats on joining the blogging world. Happy to follow you. What yummy non-caloric candy to share as well. WoWzA, that's quite a haul o'goodness, Crystal! Oh, I'm already following you ... in fact, I'm stalking you! LOLOL! WOW! What a great blog candy assortment! Love your blog. WOW! It's nice to see you in the blogging world. You have always inspired me from the moment I laid eyes on your cards. Great idea on the blog candy, hmmm...didnt even think to do that to attract people to your blog...WOW! I just love cheeries, they remind me so much of picking cheeries from my granny's farm in texas when I was younger. All the cards a re wonderful and the color schemes just shout SUMMER! Congrats on your new blog and welcome to blogland. I'll be sure to mention it on my blog and become a follower of yours. Thanks for the chance to win some great blog candy. Beautiful Crystal. I am not eligable to win because I don't blog (YET hee hee). But I wanted to tell you your blog looks great. I always love your creations over at splitcoast and always appreciate your wonderful comments on my cards. I am going to subscribe to your blog...Happy blogging. Maybe I will join in it one day. welcome to blog land! It's so addictive. Great Candy. I'm a follower and I've linked you on my blog! Hi Crystal! What great blog candy you are giving away! I am linking to you on my blog right now! Congrats on your new blog and it looks like you've been blogging for ages... a great blog! I do thank you for all the visits to mine too.... your comments are so appreciated! Hugs! Crystal welcome to blog land. I have signed up to follow you and put a note up on my blog. I'm soooo there! Count me in. I'm following! 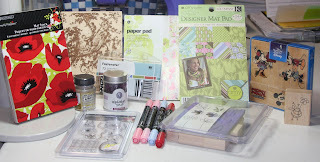 OOH i love crafty blogs!! Your Blog is wonderful for just starting out and your work is great. LOVE the pic of your new Kittens. They are adorable. I hope you blog gets all the new followers you want. Wonderful candy, thank you for offering! I will mention you on my blog today. I'm trying to get more readers/followers too...good luck! Your blog is cute and you have some great ideas! How fabulous of you! I'm linking you up now to my blog. May 14 is my birthday so wouldn't that be an awesome gift! Especially since my 17 yr old son is having his wisdom teeth pulled that day and I'm already a basket case over it! THANKS and keep up the great blogging! Welcome to blogland, Crystal! I am actually new myself. I just started in March. Hi, I haven't jumped into the blogging world yet since I am not quite sure where to start. I am hoping to get it up sometime soon though. I have subscribed to your blog thru goggle reader. I hope I qualify. :) Good luck on your blog! Thank you that give a chance to win candy. You are linked on my sidebar and I'm a follower!! I have lots of people that I follow too. Sometimes I forget to do a card 'cos I'm so keen to visit them all. I have just joined your follow list, and will pop over and brag about your blog candy. Good luck with the goal of 150 followers! For being new at blogs...yours looks awesome! Beautiful cards too! Glad I found you! I am now your 48th follower. Good luck hitting the big 100! Thanks for the chance at some SWEET candy! Hi! What great goodies! :) I linked you on my sidebar, in the section "Blog candies". Best wishes! And congratulations! Great candy, my fingers are crossed! Now I'm a follower and I linked your candy on my blog's right sidebar. Hi! Thank`s for the chance to win! the candy is fantastic! I put a link on my sidebar. Congratulations on your blog. It looks wonderful. Wishing you much blogging success. I am a follower and have added a link to your blog/candy on the sidebar of mine. Thanks for the chance to win this fantastic candy. I'm enjoying your blog Crystal! Hope you're having fun too! What a good idea to attract people to your blog, hope the idea generates some interest but count me in anyway-love the site and have added you. great blog....and fav candy thanks for the chance to win it...i become a follower and a put a link in my sidebar blog. Hello. I have just create my blog, and I love to meet people. Your idea to make a candy gift it's great. wow...what a gorgeous candy! I'm a follower and put you link on my sidebar! thanks for the chance to win! Great candy. I have included ur candy on my blog and I am a follower. Hi Crystal! Great Blog Candy! I am already one of your followers!! Your cards are amazing! Great way to get the word out! I have put a link on my blog! First, I've been enjoying looking at all your beautiful work! I'm glad I found your blog through a blog candy announcement. I've become a follower and added a link on my blog to your blog candy. Hi Crystal, Came to your blog via a blog candy alert. Great way to start off. Will go now and mention on my blog. I became a follower. Hi Crystal love the look of your blog candy I have become a follower and put a link to you in my side bar. I don't have a blog, but I have become follower number 95 so you're very close to your 100, bet you can get 150 by the closing date :) Thanks and good luck everyone! I'm number 95. You are getting close. Congrats on your blog. I'll be following. lovely blog and wonderful candy!!! A new blog?! How exciting!! Best wishes to you on your new blogging adventure! I don't have a blog of my own but I do have e-mail and I have sent a link to your site to all my crafty gal pals so that they can come visit you! Lucky me!! I am now a follower of your blog! Congrats on your new blog!! It is gorgeous, and your work is great! I am a follower, will link you to my blog and say thanks for the chance at Fabby candy! Crystal, Luv the new blog! Yes, I'm a follower. Super great stuff here!!! Thanks so much for sharing! first of all, I have to say you're WAY past the 100 followers, so congrats for that! second, that candy is really cute and special! hope I'll win! Thank you for the blog candy! i hope i will get mails when you update your blog because i dont see where is its. if the follower doesn't means updates from you- can you add me to your mailing list?? great blog and blog candy! Wonderful candy! Thanks for the cahnce to win. I've linked you through the sidebar on my blog. Great candy! I linked you http://finurasydetalles.blogspot.com and i'm your follower! At you very interesting blog. OOOOOhhhhh.... what fabulous candy! I am posting a like in my sidebar. What wonderful candy!! I know how you feel I just started my blog as well and as soon as I reach 50 followers I am going to offer candy. I am now a new follower of your blog and thank you for the opportunity to win. I have added you to my blog. Hello! I'm from Russia. Its a super candy! Welcome to blogland Crystal, and what wonderful candy you are offering already! Going to put a link on my blog now. Hi Crystal! Happy blogging and good luck! The blog candy is FAB and very generous. I've pic linked your candy on my sidebar and also becamea follower. sorry i can't link up, i don't have a blog. Candy, candy, candy! I love candy! Thanks for the chance to win. I've become a follower and added a link from me to you on my blog. Now I just hope I'm the lucky winner! Hi,Crystal! Fine blog and very lovely cards! I do mini teddy bears more, but I take a great interest cards and scrapbooking. And too I have in the blog a candy to the my birthday - mini teddy bear. What a great way to start a blog. I have joined as a follower so it will be fun to check out your creations. great blog! I'm so looking forward to following! WOW! Congrats it's nice to see you in the blogging world. Welcome! I look forward in seeing more of your creations. Thanks for the chance to win your lovely candy. Hi, thank you, great candy! Wow, what an awesome offer! I am going to add you to my follow list and post your candy on my blog. Congratulations for your new blog. I'm one of your follower but I don't have a blog yet. Your cards are beautiful. Thanks for a chance to win this great blog candy! Then I became a follower of your blog :)!Thanks for this chance :D! And what a great candy!!! Welcome to the blogging world! I'm still rather new too. I'll be happy to list your candy on my blog Here. Come by as I have candy up too, and join in it! Also, I just signed to follow. Hey Crystal....your blog looks great!! Thanks for a chance to win this FANTASTIC give-a-way!!! Love your works Crystal!!! You have a fab candy yummy!!! Thanks for the chance to win..Posted a link on my sidebar. also became your follower. Wow! what a goal you have set but with a blog as nice as yours and all that blog candy it will be no problem. Hi Crystal, you are very talented! Happy to be a follower! Your blog candy worked! It helped me find your blog and I'm glad I found it. Thanks for the chance to win some great candy. This is a great candy! thanks for the chance to win. Your blog looks great! Thanks for a chance to win. Look forward to seeing your work. Crystal, wow, you have just designed your blog!!! Good for you. I am slow on the technology, so it will take me longer. Crystal, congrats on your new blog!! I too need to jump in. Count me in on the blog candy... please! !